The GNOME desktop is able to use a sequence of images for its background wallpaper, changing them automatically over time, but does not include an interface for specifying which images should constitute such a slideshow. 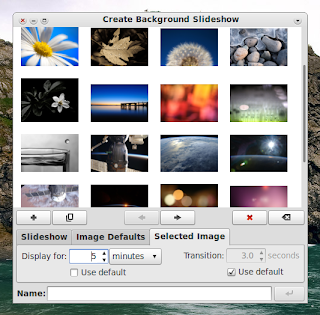 Create Background Slideshow (CreBS) is a small Python/GTK application that provides such an interface, thus saving users from having to manually edit XML files. In classic GNOME, you can find CreBS under System > Preferences > Create Background Slideshow or in Unity, press the <Super> key and search for 'crebs' and open it. Click the '+' button to add wallpapers. You can also change the sequence of the wallpapers by using the arrow buttons. Under the 'Slideshow' tab, you can configure the time duration after which the slideshow would loop back to the beginning regardless of whether all the images have been displayed or not. Under the 'Image Defaults' and 'Selected Image' tabs, you can configure the wallpaper display and transition timings. When you are finished with adding and tweaking the wallpaper settings, enter a name for your newly created slideshow and save it. Once it has been saved, the slideshow would be activated right away.